The beauty ideal: The Foolproofs. But, there are those ones that anyone can use and get amazing results with...literally. 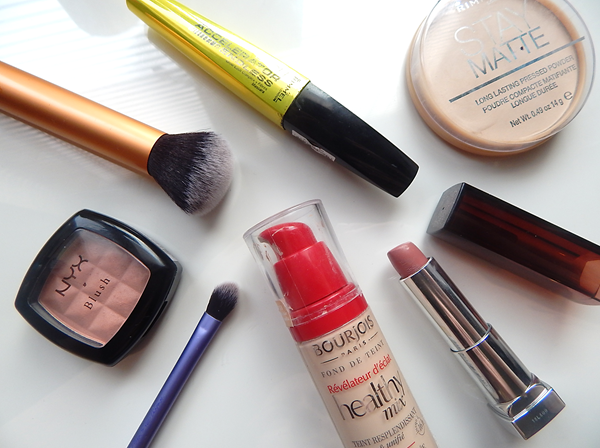 The Bourjois Healthy Mix foundation is still (and probably always will be) my all-time favourite foundation. I love everything about it - the smell, the coverage, the finish, the blendability, you name it. Even though this is a dewy(ish) finish foundation, it can work for oily skin (which I have). It's just a great all rounder. Now I promise this will be the last time I rave about this blush for a while but NYX's Angel is the perfect blush for all skintones. It looks rosy on paler skin but also adds warmth to darker skin. You can't go wrong with it. When it comes to drugstore mascaras I think the main contender is Maybelline, they do some pretty good ones - but the Lash Accelerator Endless offering from Rimmel is a good one for adding length and separation. I tend to use this mainly on my bottom lashes because the wand is perfect for them and I prefer to volumise up top, but if length is something you struggle with then this is the one for you. To be fair, it's such a quick mascara to use there are days when I just whack this on all of my lashes. Another from Rimmel is their Stay Matte powder. A cult classic in the beauty world and for good reason. It's cheap, it's cheerful and it does the job. It can get a little cakey if you apply too much so using it sparingly is key. My lipstick of choice at the moment if I don't know what to go for (and since my Loreal Collection Privee is the tiniest stump ever now) has been the Maybelline ColorSensational Lipstick in Velvet Beige. It's a light browny shade with pink undertones so it really does compliment every complexion and every makeup look. Tools-wise, I don't think anyone can go wrong with the Real Techniques brushes. They're fantastic quality at really affordable prices and if looked after correctly, they can last forever. My favourites are the Buffing brush and the Base Shadow brush. The Buffing brush is great for really working in your foundation and giving a flawless finish and the Base Shadow brush is fab at applying shadow all over the lid but it's tapered hairs are also handy at blending shadow into the crease. I couldn't be without either. It's always good to have a handful of sure-fire products in your collection - that way when you're having a crappy skin day or you're just lost, you can always fall back on these.